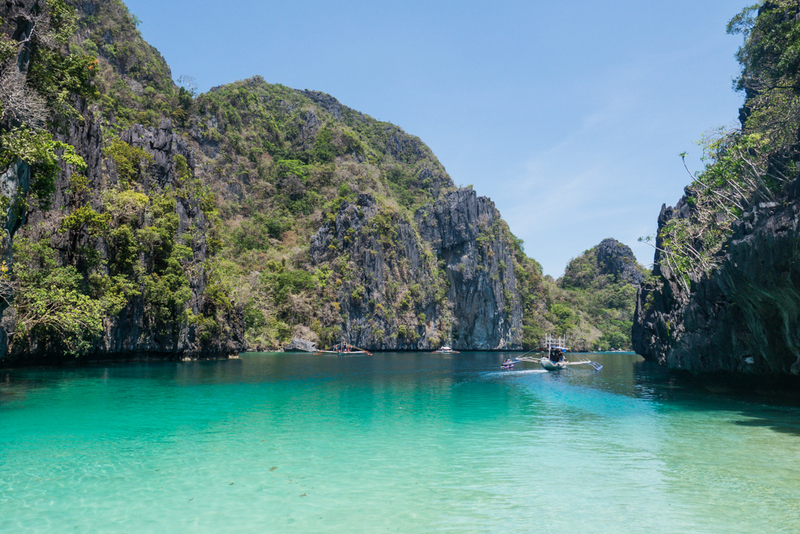 The Philippines are fast becoming the new hottest destination in South East Asia. And it’s easy to see why. The vast natural beauty, tasty seafood, cheap activities and helpful locals are enough to convince anyone. And now with cheap flights from Sydney to Manila direct with Cebu Pacific, the Philippines have never been more affordable or accessible for Australians. Are you dreaming of somewhere warm to head to this Winter? Here are 15 reasons why the Philippines should be your next destination. The Phillys are famous for their crystal-clear water and perfect beaches. Throw a bomb fire together on the beach and you have the perfect holiday. Chill out in front of your beachfront cottage with a cocktail or go for a joyride on a local fisherman’s boat. 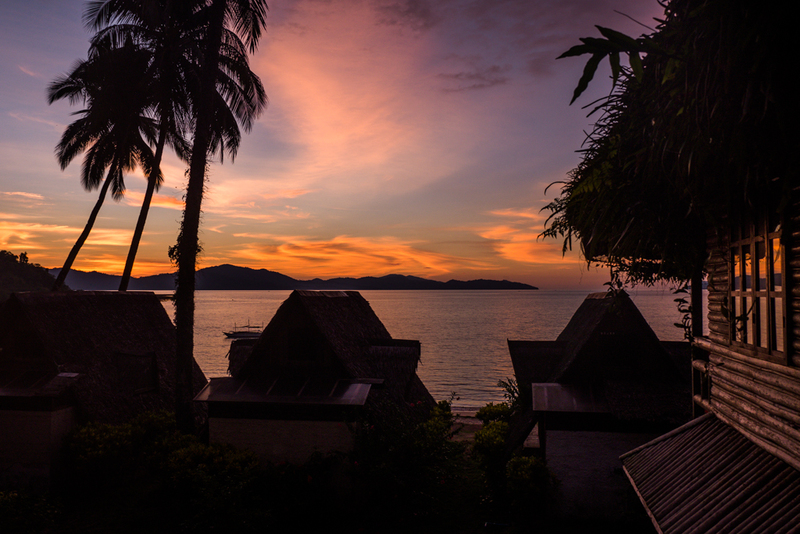 Every evening will take your breath away with an impressive display of light and colour. #3. Amazing limestone karst formations everywhere! Weather its the Underground River tour in Puerto Princesa or an Island Hop tour from anywhere, the limestone cliffs are the eye-candy of the Philippines. Sick of the beaches? 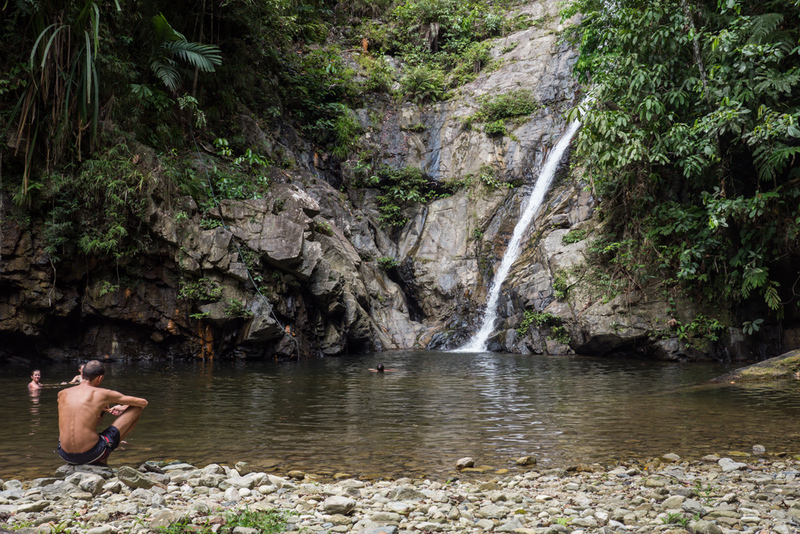 Chances are there’s a waterfall a short trek away. 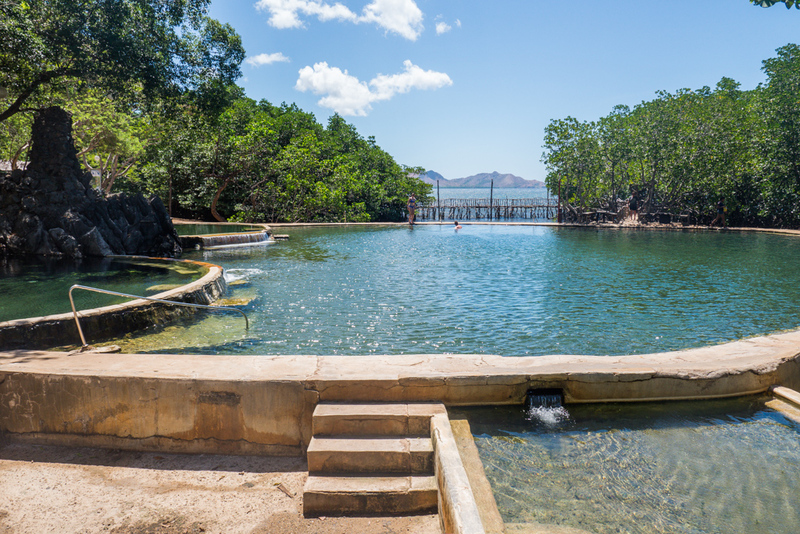 If you can’t get enough of the heat or just want to rejuvenate with naturally healing mineral-water make sure you pop in to visit a natural hot spring. Filipinos are very much into relaxation and have created what is possibly my favourite style of hammock. It’s made of weaved grasses and looks like a cradle. 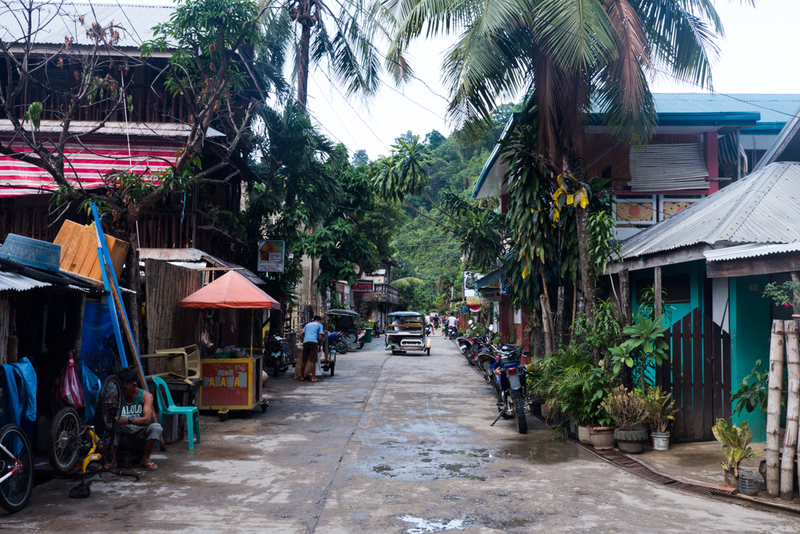 The Philippines are full of cute little seaside towns that have everything from supermarkets to BBQ’s on the beach. After a smorgasbord of seafood for a mere $10USD? Try Boodle Food. If you’re craving a $1 Fresh mango shake, easy. How about anything you can think of put on a stick and grilled in a delicious sauce? Food in the Phillys is underrated but amazing! 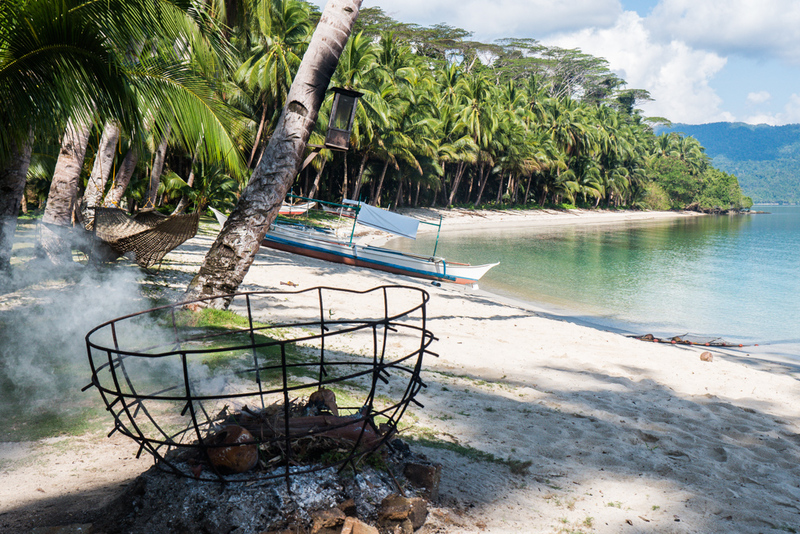 Check out What to Eat in the Philippines by Anna from Adventure In You, before you go! It’s pretty common around the Philippines to hire a fisherman and his boat to take you to a deserted island for the night. Usually they will provide a tent and food, but make sure you discuss everything you want prior to leaving. I urge you to explore an underground local market. The sights, colours and atmosphere of these markets are sure to inspire. In the least you’ll get some amazing photos out of it. 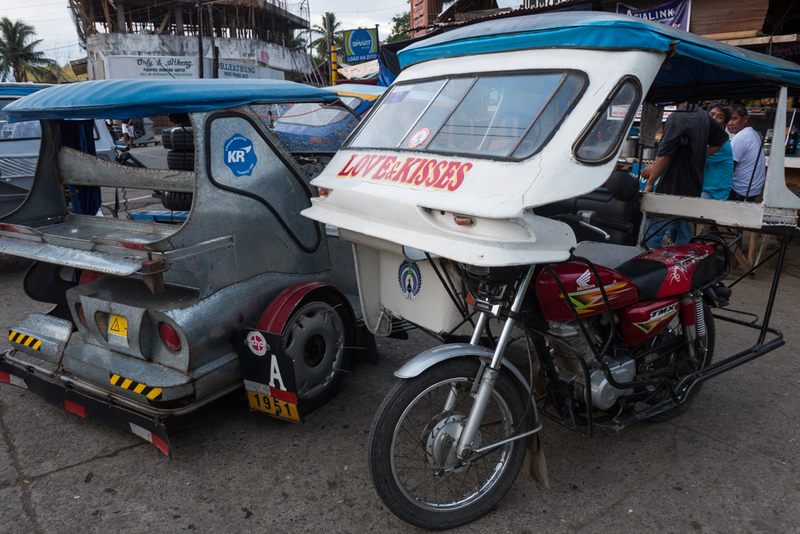 Each island has a slightly different style of Tricycle but they are all fun! I’m always impressed by how many people can fit into these things, some are like mini-trucks! These funny-looking buses are jeeps left over from the war that have been refurbished and decorated. Make sure you go for a ride on top of one. #13. Catch a local fisherman’s boat to just about anywhere! These cool, spider-like boats are readily available on most beaches to hire for day trips. Have a chat to a friendly fisherman and he’ll be happy to take you to your very own secluded beach for a very reasonable price. Coron in Palawan has got to be one of the best places in the world do wreck penetration diving. If you don’t dive, then there’s wrecks and reefs to snorkel as well. Just look at these smiles, they’re everywhere! Where are you planning to travel to next? Why have you chosen there? I am not planning on going on any vacations. Bit looking at the pictures makes me want to go to the Philippines. That deserted island is right up my alley!! Wow, what a gorgeous country! I have never seen waterfalls like that in real life, so that alone would be amazing to see. The Philippines has always been on my Travel Bucket List! I hope in this lifetime, the experience is not to be missed! thank you for providing photos and reasons why I need to come and explore! The beaches are amazing and the food looks delicious. Looks like you had so much fun. I really didn’t need any reasons other than the first photo–how gorgeous! We have had friends bring tuk tuk toys back to use from their visits and I dream of the day I can ride in one myself! Oh man, these photographs are STUNNING! They seriously make me want to jump on a plane and fly out there…..what an amazing place for a vacation! We’d really like to visit again! Last time we went it was just to do some relief work so we didn’t get to explore most of the country! A very beautiful place with fascinating history and wonderful people. Plus, it’s so inexpensive it is definitely not to be missed. Thank you for sharing your tips and pics! Wow, it is amazingly beautiful! I have a couple friends from the Philippines, and I’ve heard stories about they’re home towns, and how gorgeous it is. This is the first time I’ve actually seen for myself, and WOW. I’ve recently taken up photography this pass year, and I seriously feel like this is a place I need to go! I’ve never had the opportunity to enjoy hot springs. They always look so inviting! This is a great list of reasons to vacation in the Philippines. I love the white sand beach and the limestone cliffs are totally gorgeous. It would be amazing if I could go on a vacation there some day because everything is totally gorgeous. Thanks for sharing. I love that there is nature and also beach there. I would love to hop over the Pacific and see it for myself! Your pictures are fantastic. I’m a sucker for sunsets and your picture of one is amazing. Simply lovely! These pictures have me so jealous. The water is gorgeous, beaches are gorgeous, looks like you can go there and just be left alone :). Love the food on a leaf?! Amy Ditmore recently posted…100% FREE Credit Score and Monitoring with Credit Sesame! Thanks for the great post and pictures. I would love to see the iimestone cliffs and waterfalls. They look absolutely beautiful. May have to bump up the Philippines on my travel wish list. It’s obvious that I’m ready for another vacation. I’ve just spent a ton of time scouring your blog and looking at the lovely pictures! 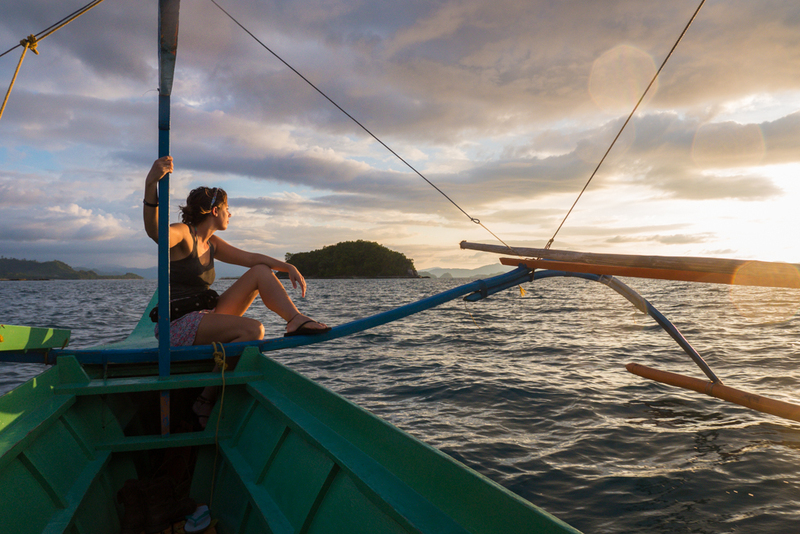 It’s time to travel again, and the Philippines may just be the perfect choice! At least you’ve certainly made a strong case for the country! I much prefer infrtmaoive articles like this to that high brow literature. It seems everyone is going to the Philippines at the moment, and not hard to see why! I love the look of those hammocks, maybe the comfiest ever? 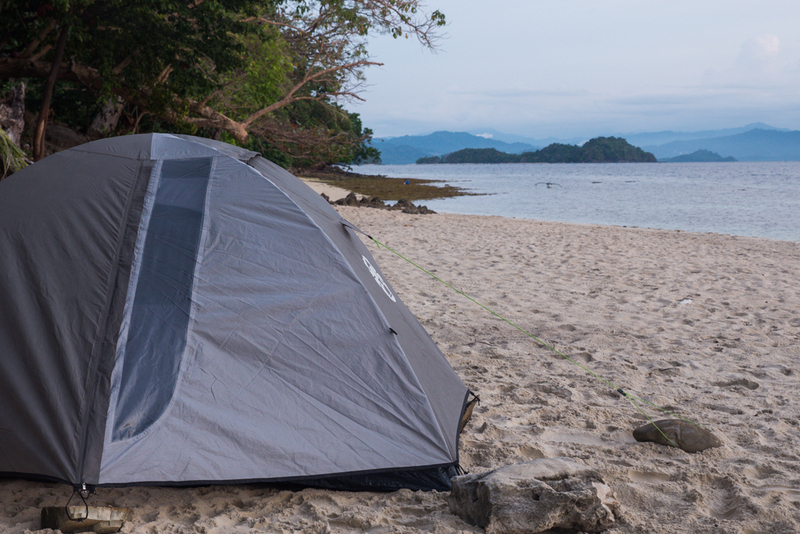 And how cool to have your own deserted beach to camp on, I’m booking my ticket now! Mmmm… quina bona pinta! Provarem de fer-lo! PerÃ² no sÃ© si trobarÃ© la recepta perquÃ¨ em sembla que has canviat el format del blog i no trobo l’Ã­ndex per foto, per noms… Anava molt bÃ© perquÃ¨ sempre em mirava les receptes d&r1827;ape#itius i era molt cÃ²mode fer-ho amb les fotos! Thanks for featuring my country, Crystal! Totally agree on all points! It looks so incredibly beautiful! My Mum lived in the Philippines when she travelled and always has such amazing stories to tell. Definitely on my bucket list to retrace her adventures! Sold!! I really want to go to the Philippines, but always had ot leave it out due to timing and budget. 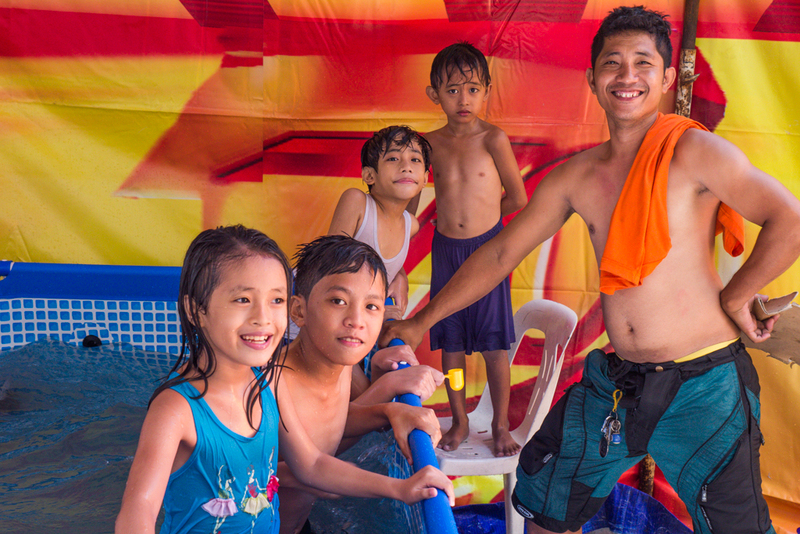 Your photos really do a great job of showing all that is great about the Philippines! You totally have me sold! Great pictures, I’m definitely gonna visit the place.